Follow all the news of Phil Keller and his magic shows directly on his Facebook page. 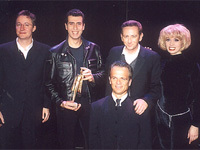 In 2002, Phil Keller received the highest award in Europe, the Mandrake d'Or. This trophy is awarded annually to several magicians worldwide recognized by the profession. 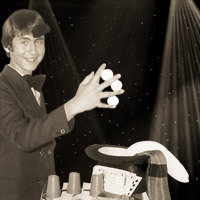 Phil KELLER began magic at the age of thirteen and attended classes at the Academy of Magic Olympia in Paris. Like all magicians, he learnt the basics of manipulating cards, coins and balls but he soon found his true talent on stage, specializing in grand illusions. He has spent over 20 years travelling around the world (Japan, USA, Spain, Greece, Portugal, Germany, China, Slovenia, Egypt, Italy), including several years on the most prestigious American cruise ships. His grand illusion show has been performed in theatres, hotels, cabarets and casinos around the world, including two years at the Paradis Latin in Paris, France. 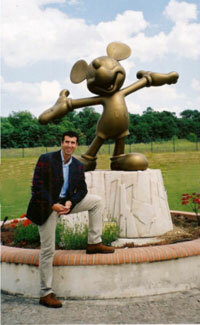 As a consultant, Phil worked with Disneyland Paris for the magical effects for the shows, including the flying of Aladdin's magic carpet, magic movements of the Little Mermaid and Mary Poppins flying. He worked on the interactive parade and in honour of Roy Disney, he made appear the statue of Mickey on the occasion of the parks fifth anniversary. Phil KELLER was presented the Mandrake d'Or in October 2002 for his career in magic. This is an equivalent to an Oscar or a Caesar film award and is presented annually to selected magicians worldwide. David COPPERFIELD, SIEGFRIED and ROY also received this award in 2000 and 2001. In 2002, he expanded his show with the appearance of a tiger and a panther and flew to the Caribbean. He stayed 5 months at the CASINO ROYALE in St Maarten before leaving for Malaysia to join the BUKIT Tinggi resort. From 2002 to 2006, he performed aboard the prestigious "Brilliance of the Seas" from Royal Caribbean Cruise International (USA) and sailed from the Caribbean to the Mediterranean. For their first visit to Europe, Disney Cruise Line called upon Phil KELLER to embark on the sumptuous "DISNEY MAGIC" to perform in the "Walt Disney Theater" during the summer of 2007. The 6th October 2007, Phil KELLER produced a new show "Illusion Passion" at the Casino Ruhl, Nice, France for two seasons. Accompanied by a cast of 10 artists, he combined dance, music and magic to produce a divine blend of revue and cabaret. In February 2008, Phil KELLER provided magic effects for the TV film "Hold-up à l'Italienne" together with Claudia CARDINALE, Jacques PERRIN, Bruno WOLKOVITCH and Etienne CHICOT. The shooting took place at the Carlton Hotel in Cannes, France. This fiction was released in spring 2009 on TF1. End of June 2010, he embarked with his complete show for two months aboard the Crown Princess of Princess Cruises and presented for the first time in the world the appearance of a car on a cruise ship. In January 2011, he was invited to China for the launch of the Hainen EMPRESS, the first cruise ship for Chinese clients. It sailed between Hong Kong and the Isle of Hainen for over a month with on board Chinese personalities. Since Phil has performed galas in theatres, cultural centres and continued to work for event agencies for product launches. In March 2012, M6 called upon Phil to create and stage illusions for candidates for "La Meilleure Danse". 2nd February 2013 Phil took on a new challenge. To make appear the eight finalists at the Ladies World Cup Fencing before more than 3,000 spectators. These magical effects remain etched in the memory of participants and spectators at Zenith Orleans for this international event.